The bathroom can be extremely difficult to decorate. Would you like a beach bathroom decor of sorts or a forest-themed one? Often, it is sparsely furnished and has typically very plain bathroom decor. It is quite acceptable to have a few decorations in your bathroom, what is vital is that your bathroom is adequately maintained and is always clean. Therefore, equipping yourself with the right know-how about how to clean a bathroom would be majorly beneficial to this task. It will help guide you through a step by step process on the best bathroom cleaning methods available today. Afterall, all the decorations in the world wouldn’t help a nasty bathroom! Once your bathroom is clean, then it’s time to get started with setting up the bathroom decor. There are many different things you can do to make your bathroom more beautiful. All you need for this is a little creativity, towel hooks, wood planks, or a picture frame with the photo of your loved ones in it, choose the perfect spot in your wall then proceed. 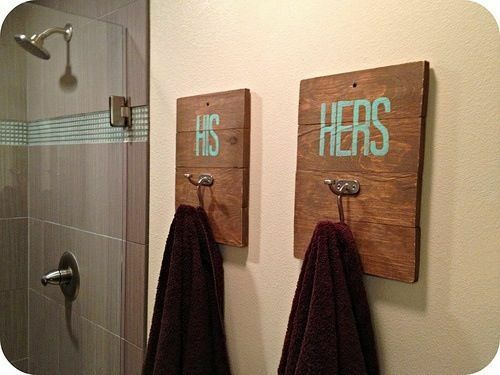 Just screw the towel hooks in place, hang the individual identifier (meaning his or hers sign or picture frame with photo) in place, screw it in or use dual-sided adhesive strips. I can recommend using Command Picture & Frame hanging strips for this purpose. This product works wonderfully when you want something on your walls and do not want to drill any holes. This product is easy to use and can securely hold in place even heavy frames or items to your walls effortlessly. 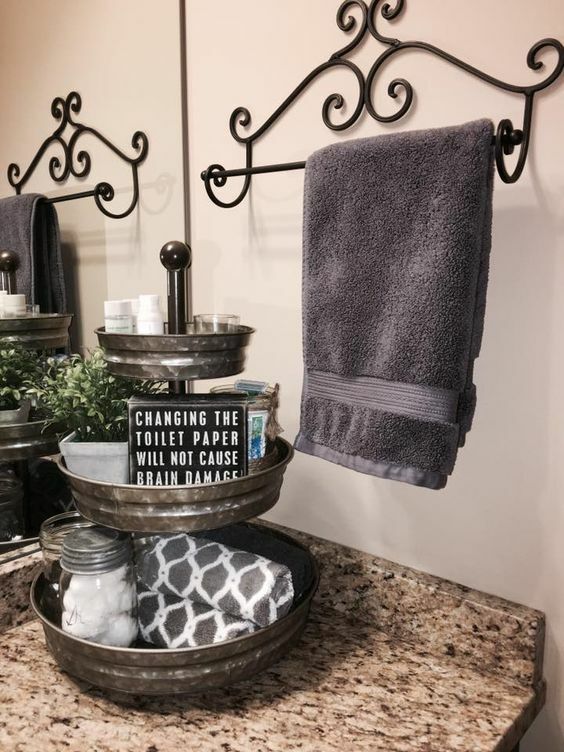 Just like that you now have wall art that pulls double duty and works as a unique towel holder for each of your family members. Never get confused again, everyone will know which towel is whose, and it looks fantastic as well. One of the most ingenious bathroom hacks I have come across. I included this in my previous article as well “The best bathroom wall décor ideas,” and I wanted to share this with you once again just in case you missed it. The beauty of this particular bathroom décor is its simplicity and efficiency plus you don’t often see this in too many bathrooms, so it is still unique. If you cannot find this in your local store then just process an order online through Amazon, they are quite inexpensive. Make the order, wait for it to be delivered and hang it up on your bathroom wall. Simple as that, no assembly required and it will last you a very long time. 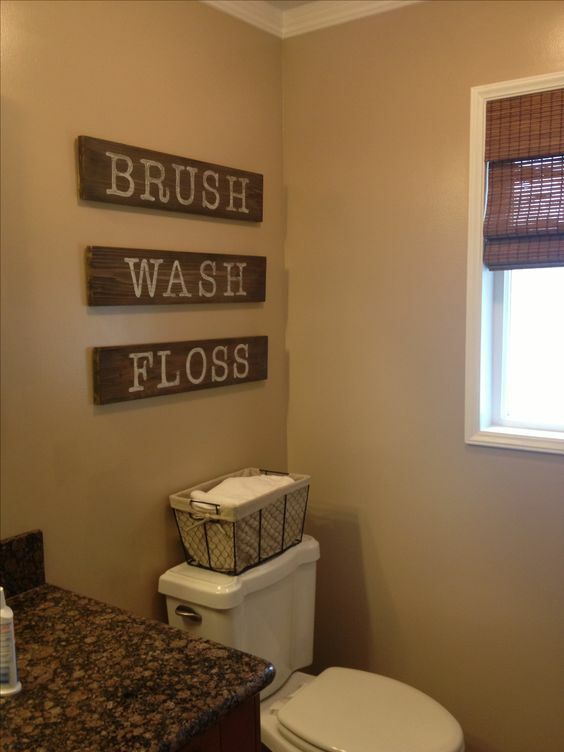 This is an excellent idea for your bathroom décor. Not only will it provide you with additional storage for various bathroom items and your Knick knacks but it will also serve to enhance the artistic imprint of your bathroom. There are several different types of shelves that you can use for your bathroom. There traditional kind, which you can use if you have ample space for such an accessory. You can choose to purchase bamboo or chrome tower shelves. Just buy and follow the instructions to quickly assemble. Either one would look great, the best thing to do is match it to the rest of your bathroom décor. Floating shelves would work better if you don’t have too much space or just like the way they look. This type would require a little more effort during installation, but the rewards would be well worth your time and effort. You can also purchase them online or at your local hardware store. 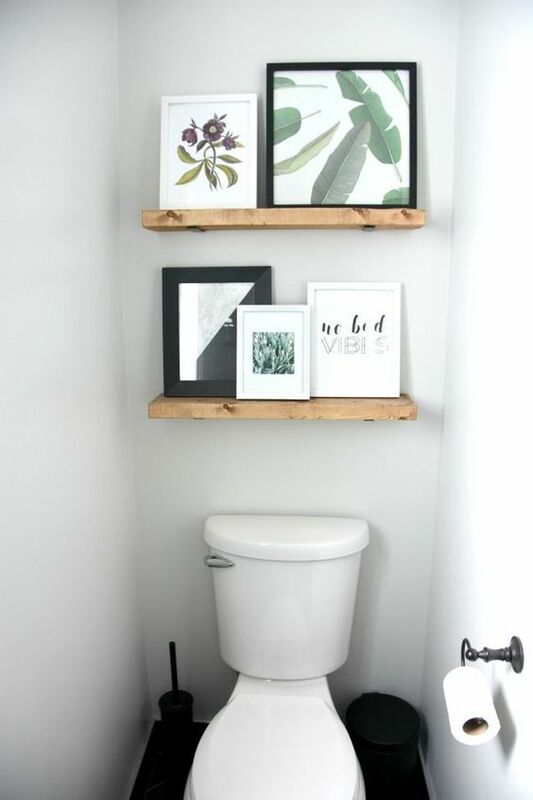 Another option would be ladder shelves; these would fit nicely behind the toilet bowl. Easily purchased online or your local hardware store as well. Some assembly would be required, but that would be it. Choose any one of these three shelving options to add style and provide additional storage for any bathroom. Feel free to choose more than one option to augment your bathroom décor. This is ideal if you have a lot of personal beauty/ hygiene products that are in drawers or cabinets. Look for stylish matching containers that can hold all your bathroom essentials. Find a bathroom organizer tray to keep your containers in. If you do not have one, don’t worry you can purchase one online. In case you have something you can use as a makeshift tray for your bathroom then feel free to use that instead. You can go with a level tray or choose to use a two or even three-tiered trays. [G45] Putting these various items in similar containers on a platter would make your bathroom look more organized and serve as additional bathroom décor. Most bathrooms have very plain walls. It is common to find a towel rack or two, and that would be the extent of any décor on the bathroom walls. Try printing a copy of your favourite paintings and share them with the family by hanging them on the bathroom walls. It would bring some culture to your bathroom plus it would be a sweet treat for you to have it displayed in the bathroom as a hidden gem of sorts. To make a picture or painting waterproof simply have it laminated or you can do this yourself if you have a machine. Then just put the picture or painting in a beautiful frame and hang up in an empty spot on your bathroom walls. There are many different options on what to hang on your bathroom walls. Funny quotes, puns, favourite quotes or life lessons, it indeed is up to you. You can paint them on wood or print them out, laminate them and put in a picture frame to transfer to wood. The possibilities for bathroom wall art is vast. Use your imagination, and the possibilities are endless. If you are still at a loss on where to start after reading through this article, that’s fine, what is important is to begin. Begin by imagining how each of the options listed above will look in your bathroom and go with your gut. These are reasonably easy to do, picture each one and check if it would work for your bathroom and get it done. You can quickly change the bathroom décor around anyway.